I’m staring at Rafe’s hand. Big, strong, callused. A scar runs from his thumb to the index finger. He’s looking at me, waiting. So I lift my hand, place it in his. It fits on his palm, smaller, darker, thinner. He seems as entranced by the contrast as I am. His fingers curl, closing around mine. His lips part, but no sound comes from his mouth, and his gaze remains fixed on our entwined hands, pale lashes hiding the gold of his eyes. Now I’m the one caught, transfixed. His mouth looks soft, vulnerable, at odds with his strong, angular features and the broad set of his shoulders. The need to touch his face is overwhelming, and I step closer, so close I can sense his scent. Not a cologne, but the deep scent of his skin, like musk and warm metal. I can see the rise and fall of his chest underneath the black Deathmoth T-shirt he’s wearing under his open jacket, see the outline of his strong pecs. We’re standing so close our breaths mingle, and our bodies touch in places as we shift, feathery brushes that send fire across my skin, into my belly, making me ache. He places his hands on my waist and I grip his thick, sinewy forearms. My stomach drops as if I’m standing at the edge of a precipice, on the edge of a moment that can change everything. What’s happening? It’s as if in the hollow darkness, the barrier between us is crumbling, the wall he’s set between himself and the world is falling. His hands tighten on my hipbones and his lashes lift, his gaze moving to my mouth. His breathing is ragged. He tugs me against him, his fingertips digging painfully into my flesh, his arms flexing with barely controlled strength. His arousal presses into my stomach, hot and thick, caught sideways in his jeans. My mind fills up with static. 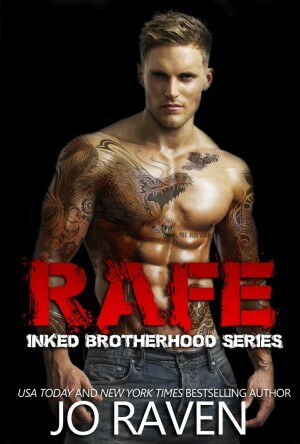 Rafe wants me. There’s the solid proof of his desire. The heated gaze I’ve felt so often on me is translated into a physical reaction, and it makes me feel so hot I might burst into flames. He’s so handsome, I can’t help myself. I want to stroke his square jaw, drag my fingertips over the golden stubble on his cheeks, kiss those damnable dimples.